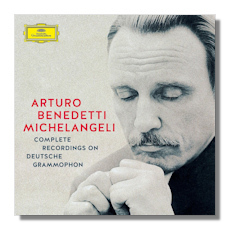 Even among artists, Arturo Benedetti Michelangeli was considered a bit of an odd duck. He canceled concerts and recording projects constantly. He was idiosyncratic in both his lifestyle and his piano playing. His rare appearances were events. His greatest recordings are classics, while others continue to perplex and even incite controversy. Long-time collectors probably have almost everything in this box, which includes his eight Deutsche Grammophon albums, a disc of live material, and a rare Decca recital. While the covers are "original jacket", the actual discs are not (for example, the "Emperor" Concerto gets a coupling for the first time that I can remember). This means that you get real value for what you pay for. Let's get the bad news out of the way first: the Schumann Concerto under Barenboim is awful. I'm sure that some piano players and fans can appreciate the details here – whatever those may be – but the performance is sluggish and very badly recorded. Barenboim's tenure in Paris is mostly forgettable, and this does nothing to contradict that opinion. On the other hand, the Debussy Préludes that fill out the disc (two each from both sets) show the artist at his most personal. Whether that salvages the program is up to you, but these four selections are stunning. Also, appearing here is a program of Beethoven, Scarlatti and Galuppi that may also be new to some collectors. Recorded on Decca in 1965, it contains some repertoire not otherwise found (to my knowledge) elsewhere in the pianist's official discography. To my ears, the playing in 1965 is less mannered than it would later become, and I find the sonic quality to be perfectly acceptable on my modest sound system. This recital, along with the Debussy that possibly saves disc nine, may be enough to entice piano fanatics to go all in on a box that they might not otherwise need. For the rest of us who may not have most of this material, this set is a great bargain. Sure, the Mozart concertos under noted producer Cord Garben and his NDR forces are ice-cold in their perfection and diamond-edged hardness, but nobody can say they aren't distinctive. Just as interesting – albeit possibly more accessible – are the three live Beethoven concertos under Giulini. It's an odd pairing of two very different personalities, but it works, especially in a grand and noble "Emperor". The Vienna Symphony, never the most reliable of bands, plays with finesse and plenty of character. With the solo selections, we find reference-worthy Debussy, some highly personalized Schubert and Chopin, and some very quirky (but also compelling) Schumann. The Brahms is widely accepted among the critical community as one of the best late Michelangeli recordings, and sounds very good. Everything else has divided opinions in one way or another, but there's not a single work among these discs (Schumann Concerto aside) that's not technically outstanding and unmistakably personal. Basically, a law onto himself, the pianist could do things even in his last years that the rest of us only dream of. Whether he should have is a matter of taste, and in the Beethoven and Mozart Concertos especially, I could see collectors leaning in other directions. However, the best of these recordings continually befuddle, baffle, and inspire, and we should be thankful to Universal for this inexpensive way to acquire them all together.